These new X Press pods from Sephora have people talking. Love them or hate them! I am actually all for these. I have nails that are shorter rather than longer and dont wear polish for more than 2 days before changing the colour so these seem fantastic to me! I don't need to touch up, and I can't see my nails being too long to get enough coverage from a pod. White Matter (opaque bright white). 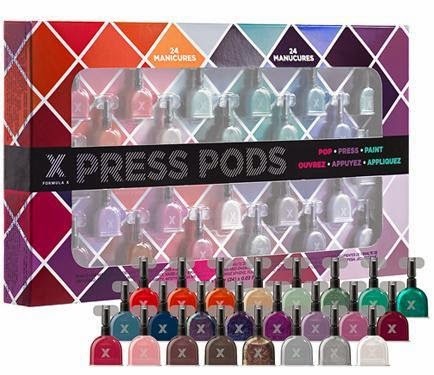 At $47 for 24 separate manicures and shades I would be all over this if it didn't retail for only $39 in the USA. At todays exchange rate (which is not great) its $42 Canadian. So why are we paying almost $50?! If only they would sell all the polishes this way. They could price them at $3 each or 4 for $10. I think it would be FANTASTIC!! That being said, I am very likely going to pick this up as soon as a great promo code for a sephora freebie comes up as I am totally digging the formula of this brand! I'd buy it if I make it to the US this year. I love the smaller bottles but never manage to finish any nailpolish. I loved the 5ml bottles I bought in Europe this spring. No fancy name brands. I'd buy it if it was the US price. The Cnd one is over priced. I think these would be great for trying colours and handy for traveling. I think it would be handy for traveling or trying on colours, but I'd like to purchase the colours individually or like you said a cheaper combo price for 4. I'm not into it. I'd rather just buy a mini bottle. If I'm traveling why sit around painting my nails when I could just grab some nail wraps? The pods are meant to be tossed away so I'm unsure of what the brush might be like, and I don't know how much polish you get-- if you screw up do you have enough for repairs? If the polish is thin or patchy do you have enough for 2-3 coats? If I'm dead-set on painting my nails while on vacay I'll bring bottles so I can paint without worrying of running out. It's a neat idea, but I don't think it comes close to the convenience of a nail wrap.